3 Oct 2018 Washington, D.C. The polls, from North Dakota, Indiana, Arizona, Missouri, and Tennessee, show Republicans in most of the races in the strongest positions they have been in all year against their Democrat opponents. The best news for the GOP is in North Dakota, where incumbent Democrat Sen. Heidi Heitkamp (D-ND) trails her GOP challenger Republican U.S. Senate nominee Rep. Kevin Cramer (R-ND) by 12 ponts–the biggest lead Cramer has opened yet. That North Dakota survey polled 704 likely voters and has a margin of error of 3.5 percent. It shows Cramer at 53 percent, to Heitkamp’s 41 percent–a stunning 12-point margin that comes on the heels of a recent local news poll earlier this week showing Heitkamp trailing Cramer by 10 points. In the last Fox News poll on this race earlier in September, Cramer only led by 4 percent–so the news he has opened a commanding 12-point lead on Heitkamp is welcome among Republicans on Capitol Hill and throughout North Dakota as it appears Heitkamp is headed to a place where the lead Cramer has over her may become insurmountable in the final weeks of the campaign. That’s hardly the only good news for Republicans in this latest Fox News Senate race battleground poll. In Tennessee, where GOP Rep. Marsha Blackburn (R-TN) faces Democrat and former Gov. Phil Bredesen for the seat being vacated by retiring Sen. Bob Corker (R-TN), Blackburn has finally opened a sizable lead over her Democrat opponent. Blackburn, at 48 percent, is 5 percent ahead of Democrat Bredesen–who’s down at 43 percent. Other polling on this race has showed it very close, but this poll comes just days after President Donald Trump campaigned with Blackburn earlier this week–and as she is one of the strongest allies of the president in the House, he wants her in the U.S. Senate, and certainly does not want Democrat Bredesen. The Tennessee poll surveyed 666 likely voters, and has a margin of error of 3.5 percent–meaning Blackburn’s 5 percent lead is outside that margin of error. If Blackburn is able to continue on her upward trend and lock this seat down for the GOP–not too difficult a task with Trump on her wing in Tennessee, a state that reveres the president–Republicans will breathe another sigh of relief as that leaves just a couple other currently GOP-held Senate seats in play in the midterms up for grabs. That brings up Arizona next, where Rep. Martha McSally (R-AZ)–the GOP nominee for the U.S. Senate there–is now inside the margin of error against Democrat Rep. Kyrsten Sinema in a close race, per the Fox News poll released Wednesday evening. Sinema’s 47 percent only beats McSally’s 45 percent by 2 percent in the race to replace retiring Sen. Jeff Flake (R-AZ), inside the poll’s 3.5 percent margin of error. Over the course of September, Sinema has seen a lead of as high at one point as 7 percent in one survey dwindle back down to just 2 percent in this one, per the RealClearPolitics list of latest surveys–a welcome sign for the GOP. This latest Fox News poll had a sample size of 716 likely voters. In Indiana, Republican Senate nominee businessman Mike Braun trails Democrat incumbent Sen. Joe Donnelly (D-IN) by just 2 percent–Donnely, at 43 percent, leads Braun, at 41 percent–inside the survey’s 3.5 percent margin of error. This survey polled 695 likely voters. While good news for Braun in that he is in striking distance of beating Donnelly, it does represent a 4 percent slide from the last Fox News poll on this race where Braun was leading 45 percent to 41 percent. Donnelly is expected to vote against the confirmation of Judge Brett Kavanaugh to the U.S. Supreme Court, too, something that is playing horribly with Hoosiers back in Indiana–so Braun has been hammering him on the issue on a daily basis. That all brings us to Missouri, where Attorney General and GOP Senate nominee Josh Hawley has now pulled into an even tie with Democrat incumbent Sen. Claire McCaskill (D-MO). In the state that slipped through GOP hands in 2012 but is now clearly back in play, Hawley and McCaskill are in a dead even tie at 43 percent apiece. The survey, with a margin of error of 3.5 percent, has a sample size of 683 likely voters–and like each of the other Fox News polls released Wednesday evening was conducted from Sept. 29 to Oct. 2. In the wake of the Democrats’ smear campaign on Kavanaugh, Republicans have seen a resurgence in polling–and a newly energized GOP base matching the Democrat base. 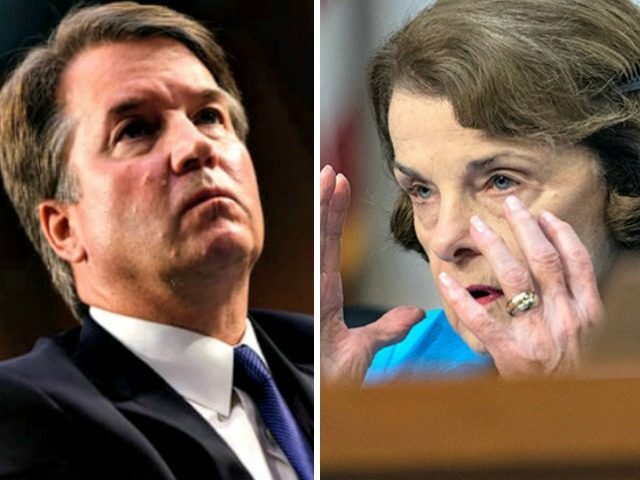 “Poll: Amid Kavanaugh Confirmation Battle, Democratic Enthusiasm Edge Evaporates,” was the headline on NPR about its latest Marist poll released earlier on Wednesday. As it has swung back in the GOP’s direction, individual races are starting to peek through with GOP leads or advantages as evidenced by this latest round of Fox News polls–but also a series of other polls and surveys that have showed the GOP on the march nationally with a month to go. In New Jersey, for instance, incumbent Democrat Sen. Bob Menendez (D-NJ)–who has been crippled by corruption scandals that led to the conviction of his longtime friend and donor Dr. Salomon Melgen as well as a mistrial against him–is in a tight race against Republican Bob Hugin in New Jersey. Republican Matt Rosendale, the state auditor in Montana, is in a near-tie in many recent polls against Democrat incumbent Sen. Jon Tester (D-MT) in the northwest. And other races, like the Ohio battle between incumbent Democrat Sen. Sherrod Brown (D-OH) and GOP Senate nominee Rep. Jim Renacci (R-OH) or the West Virginia fight between Attorney General GOP Senate nominee Patrick Morrisey and Democrat incumbent Sen. Joe Manchin (D-WV), are proving to be tighter battles than previously thought. It’s still early in the campaign, but Democrats who were banking on a blue crashing over America may never see one–at least not when it comes to the Senate races.